At one point, some unknown time ago, I said that I would not perpetuate rumors especially when it came to Halloween Horror Nights. It turns out I’m a dirty rotten liar. LET’S TALK ABOUT SOME HALLOWEEN HORROR NIGHTS RUMORS! DISCLAIMER: The following is strictly rumor, speculation, and nothing official. Only when announced by the overlords of Halloween Horror Nights is it factual. I’m just an HHN fan with too much time on his hands and a blog. So calm down and enjoy the fun. It looks like Michael Myers will be returning to Halloween Horror Nights this year but not in the way that I, or anyone else originally suspected. 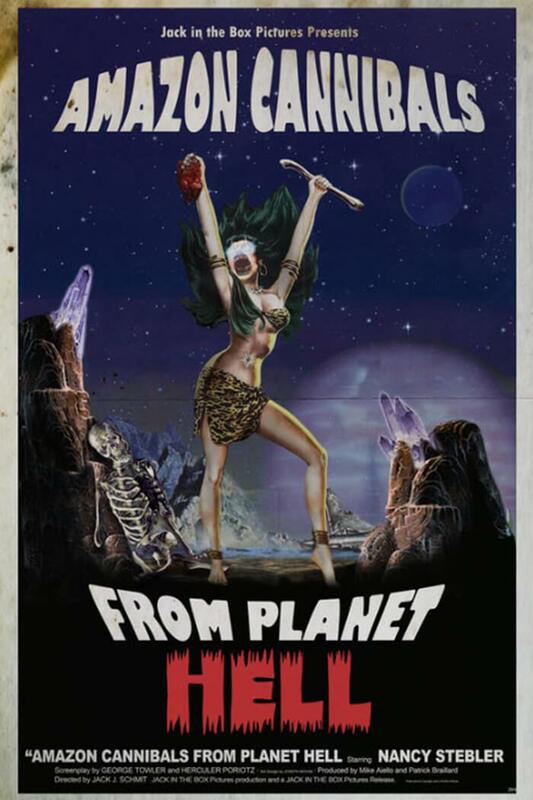 As I mentioned in my last post (It’s Going to be Totally Bitchin’) it wouldn’t surprise or irritate me to see a Halloween Maze his HHN this year given that I’m actually excited by the new film. Granted the maze would contain spoilers for the film which doesn’t hit theatres until mid-October. It would turn out that the rumors of the Blumhouse sequel coming to the event are about as dead as the counselors at Camp Crystal Lake. Rumor has it that reshoots for the film stalled out any talks of a maze based on the Blumhouse version. As we’ve seen Halloween 1 and 2 already it would only make sense to move down the line. As all of us do our best to pretend that Season of the Witch doesn’t exist, it looks like Halloween 4: The Return of Michael Myers (1988) will be the subject of a maze at Halloween Horror Nights 28. This matches up with Killer Klowns and Child’s Play which were both released in 1988 so I’m standing by it. As of right now, it has only been announced for Hollywood but it would seem that it’s a very real possibility to join us on the east coast as well. Sure, I enjoyed the first one. I liked the second one better. The third one was decent. In all honesty, I haven’t seen the new movie yet, it’s on my agenda once I get back from my cruise, but I’ve said it before and I’ll say it again: The Purge is a lazy move. It’s a lot like the overkill of The Walking Dead mazes. You’re recycling the same things over and over again only instead of zombies it’s guys in masks with guns and knives. It can be set anywhere and doesn’t really require much creativity on behalf of any of the designers. I’m not looking to belittle anyone and I’m sure there’s more to it all than I will ever know (*cough*contracts*cough*) but I really can’t believe that we couldn’t come up with anything better. Blumhouse deserves a chance at redemption for a lackluster house last year but The First Purge isn’t going to be it. American Horror story is still a big possibility for this coming year. I originally shared thoughts on a scare zone idea but as the roster is full, it’s time to move on. Word on the street is that AHS will be returning to HHN on both coasts for 2018 in the form of single season houses. For Hollywood it looks like they will be traveling back in time to Asylum which the east coast will be hanging out with some Trump supporters- I mean cult members. The 7th season of the horror anthology show is rumored to be getting a full house this year which gives us even more clowns to look forward to. None of them clowns I want to see but maybe my wish will come true in 2019. Then comes talk of shows. Academy of Villains is a confirmed lock for this year, the announcement coming sooner than it had last year. There’s the question of where they could possibly end up. With Bill & Ted retired, there’s talk that AoV will end up on the Fear Factor stage and I honestly hope this isn’t true. The true draw of the show comes from the intensity of the group being up close and personal with the crowds. I can only hope that we’ll see them on the Mel’s stage once again (hopefully slightly more hurricane-proof). But what’s to come of the hole left by Bill & Ted? Well, at one point there was the rumor of David S. Pumpkins taking the spot and hosting a show and this is still a possibility. The character is owned by NBC and Universal is nothing if not a great friend of the network, but I have another thought that’s been spurred on by the 80’s theme of HHN28. I mean, why the hell not? The movie came out in 1988 (much like Child’s Play and Killer Klowns along with the rumored Halloween 4) so why not continue that trend? The character already exists in the park as a walkaround and the Graveyard Revue show was a fan-favorite and deeply missed! I think Beetlejuice would be the perfect host for a show ripping on the past year in pop culture, politics and whatnot. Maybe even bring back some of his classic monster friends? I really just miss the Graveyard… not even going to lie. NO DANNY TANNER DON’T TELL ME HOW TO LIVE MY LIFE. UNIVERSAL REPLACED A QUALITY SHOW WITH A RIDE THAT IS TERRIBLE AND I SHALL FOREVER BE BITTER SO DON’T YOU START WITH ME YOUNG MAN! Let’s move on to talk of Icons. There’s little be said in the blog-o-sphere about the subject which I find interesting as some weird easter eggs were dropped in the announcement of the Sinister Sinema house in the form of the movie posters. The first egg plays to my Halloween theory. 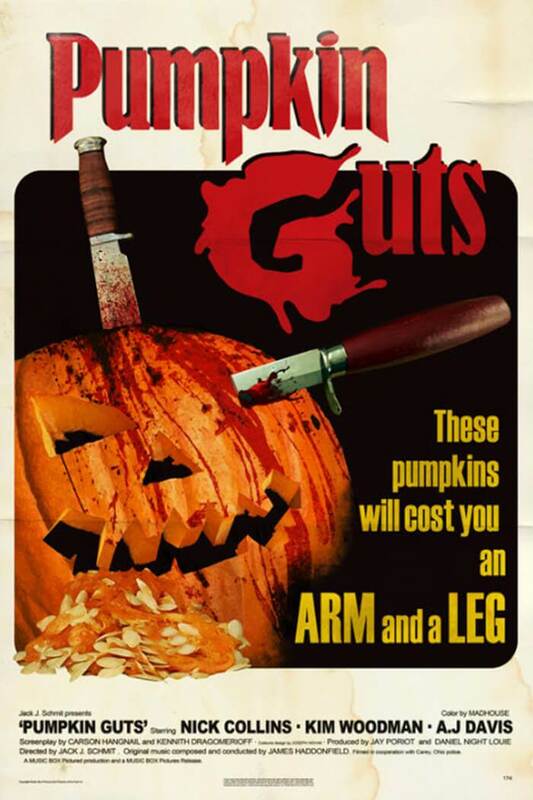 Take a look at the Pumpkin Guts poster. The music for the film was composed and conducted by James Haddonfield. You’ll recognize that name as the town that Michael Myers terrorizes in the original film and returns to in Halloween 4 to go after his niece Jamie Lloyd. 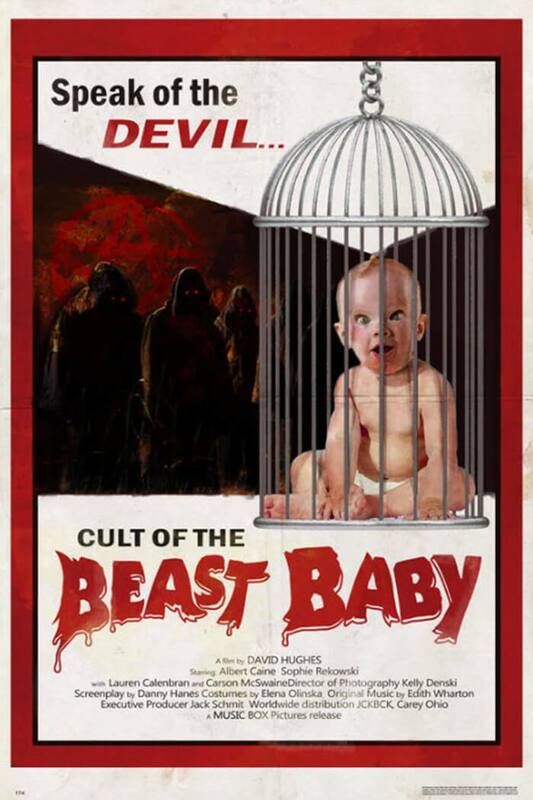 It could just be the creative team having some fun with HHN Junkies but I’m curious about the distributor listed on the Cult of the Beast Baby poster: JCKBACK. Could the event’s most beloved icon be returning to the event? I realy realy realy hope your right about Halloween, but I would love another walking dead house. I’ve. Been threw 4 already. But I only started watching the show this year so would appreciate it so much more this year! I feel the same way about The Walking Dead as I do The Purge. It’s an easy/lazy concept. I think that’s why I’ve loved the original content houses more the past few years, it’s something fresh and different. Though I will say that I was very impressed with The Walking Dead walk-through attraction in Hollywood.